Serving the surfer and sk8r Nation! Help us help kids. If you don't know the City of L.A has eliminated the budget for all L.A city sk8parks for the remainder of of 2008 and the fiscal year of 2009. I find it very disturbing that the priorities of L.A city don't include the youth of the city. As sk8park director for Gilbert Lindsay sk8park, I know first hand the positive impact the sk8park had on the community.Gilbert Lindsay Sk8park located in one of the most crime ridden areas of L.A, (42 ave and Avalon Blvd) the Gilbert Lindsay sk8park was a source of inspiration and a safe haven from the thugs and criminals that roam the area. 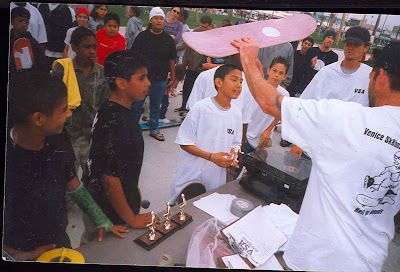 Not only did the program teach kids how to sk8, more importantly the program helped breakdown the walls of racism. Being the only White man in an area with all Black and Latino kids I was constantly bombarded with the bigotry and racism that has been instilled in the kids. However through sk8boarding these kids have been shown that compassion love and togetherness is not an alien concept, that we all have more in common than we are different.Now that our budget has been eliminated, and my one staff member layed off, the sk8park has began to deteriorate.The kids are being siphoned off by bad influences and I fear for their safety. VSA members had helped lobby and build this sk8 program. I have 30-50 kids ages 5-25 arrive daily to participate in sk8board related activities. The fiscal budget was only $30,000.00 for two staff as well as programing. The Mayor earns over$250,000.00 per year.City council members earn over $125,000.00 per year. Why is it the most disadvantaged, the poorest, the least educated are made to bare the burden of incompetent fiscal planning? Why are the highest paid not taking a pay cut along with the rest of L.A city employees? If All City council members took a 10% pay cut ( I have received a %25 paycut) along with the mayor, all L.A City sk8board programs can continue to operate.